The prawns were still alive. They lay on the baking sheet, glaring at me balefully with their beady black eyes and feebly waving their legs in an attempt to fend off my basting brush. I painted them with melted butter, showered them in a mini hailstorm of salt and pepper and carried them over to the oven. I hesitated, then muttered, “I’m sorry. This should be quick.” before sliding the tray under the broiler. Lesson learned: these little guys stay motile for quite some time after you bring them home from the live seafood tank! In San Francisco, I was able to find them at Sunset Supermarket, and they are easily recognizable from their red and white banded legs. They taste distinctly different from your average shrimp – their flesh is much sweeter and pleasantly chewy. I decided to serve them with a risotto made with shrimp stock, for double the seafood oomph. The shrimp stock is quick to make, especially if you already have the shrimp shells lying around. (tip: whenever I make something that calls for peeled shrimp, I usually buy whole unpeeled shrimp and throw the heads and shells into a Ziploc bag in the freezer.) You can peel the spot prawns before broiling to make them easier to eat afterwards, but I do find they stay moister in the shell. Plus, I like getting my hands messy with cracking open their oversized heads, letting the juices run out and soak into the risotto. Enjoying everything the prawns have to offer is the least I can do for subjecting them to death by broiler. Cut the tomato in half and grate it on the holes of a box grater. Discard the skin. Bring the stock to a gentle simmer on the stove and keep it simmering while you make the risotto. Pour 2 tbsp of olive oil into a saute pan over medium high heat. Add the onion and saute, stirring frequently until translucent, about 5 minutes. Add the grated tomato and saute for a minute or so until it thickens a little. Add the rice and cook, stirring often until the grains begin to toast and smell nutty, about 2 minutes. Pour in the white wine and stir until it is absorbed, another minute. Add a ladle of stock and a pinch of salt to the rice, and turn the heat down to maintain a simmer. Stir frequently until the stock is almost completely absorbed. Then continue adding the stock a ladle at a time, always waiting until the broth is nearly fully absorbed before adding more, and stirring frequently. This will take about 20 minutes. The grains should be completely cooked through and tender, but still firm to the bite, and the rice should have a creamy consistency. When you shake the pan back and forth, the rice should move en masse with it. 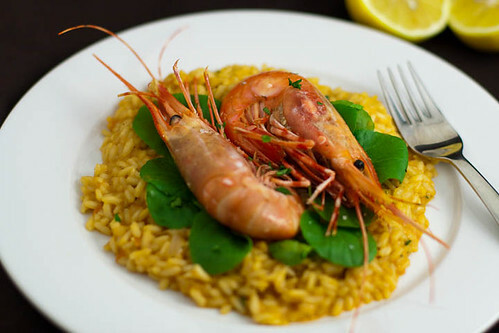 About five minutes before the risotto is done, lay the prawns on a baking sheet. Brush them on both sides with melted butter, and sprinkle liberally with salt and pepper. Slide the tray under the broiler, and broil on high heat for 3 minutes on each side. When the risotto is cooked, season with salt and pepper to taste. Turn off the heat and stir in the lemon zest and parsley. 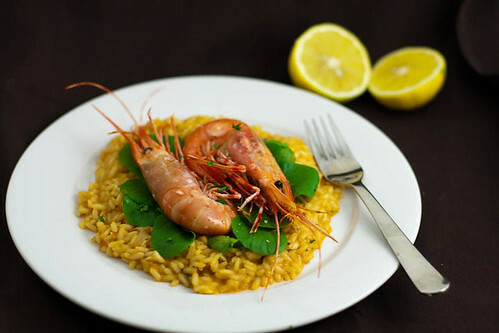 Pile the watercress on top of the risotto and serve with the prawns on top and a squeeze of lemon. Pour a swirl of oil into a large pot over medium heat. Add the shrimp shells and heads, and saute them until they are bright pink and very aromatic, about 10 minutes. Add the chopped onion and garlic and saute for another 2-3 minutes. Add the tomato paste and saute for a minute. Pour in the water and add the parsley sprigs. Bring to a boil, then lower the heat and simmer for 20-25 minutes, until the liquid has reduced to about 8 cups. Strain the stock. You can refrigerate it for a few days or freeze it for later use.